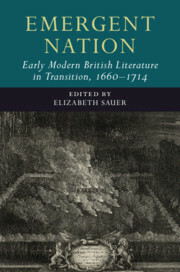 Early Modern British Literature in Transition offers a new way of reading more than 150 years of British literature and history. Concentrating on instances of transformation, the three volumes in the series do not present an empirical survey for the decades under discussion. Instead, they read across traditional demarcations - the Elizabethan age, the early seventeenth century, and the Restoration - and re-evaluate both previous scholarship and previous narratives of the relation between writing and culture. One of this series' underlying premises is that literature actively engages with - expresses, shapes, subverts, questions, avoids, and is influenced by - the conditions in which it was composed and published. These engagements were especially important during the early modern period as writers coped with, among other things, the rise of print, the death of a king, and the emergence of a national vision of empire.